This is the perfect dessert for a Valentine’s Day dinner à deux. 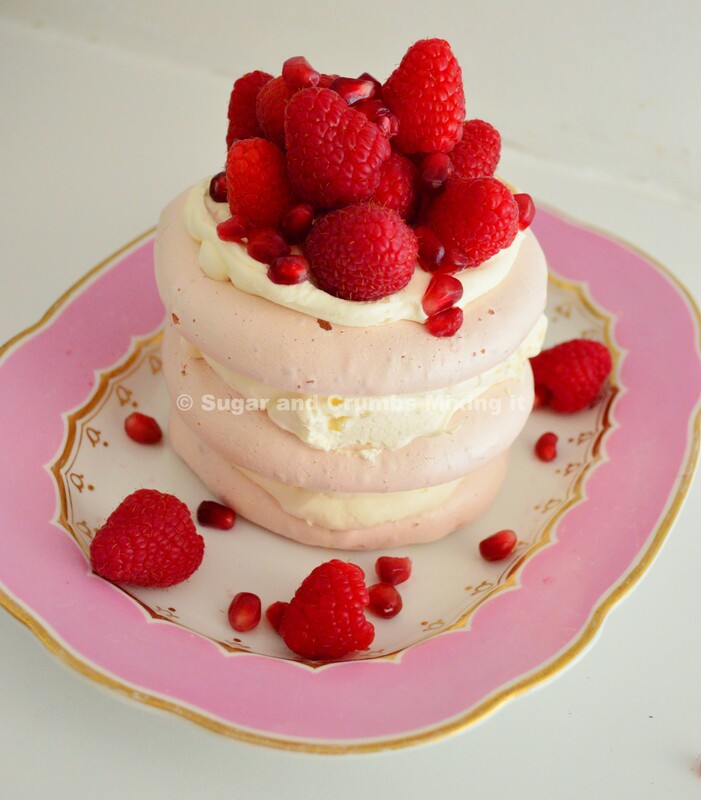 It looks rather fabulous but actually isn’t too tricky to put together – light and fluffy meringues made with Sugar and Crumbs Raspberry Ripple Icing Sugar, sandwiched with whipped cream and piled up with fresh raspberries and pomegranate. These quantities will make two smaller pavlovas, each perfect to share with two spoons, but you could of course make them individual or make one large one. 1. Preheat the oven to 150°C (140°C fan), and then start by making the meringues. Separate the eggs very carefully – if you get any yolk in the whites, they won’t whip up properly – and then add a very small drop of lemon juice to the whites before you whisk them, to reduce the risk of overbeating. Whisk the whites until they are beautifully fluffy and start to form soft peaks. You don’t need the yolks for this recipe – try using them for this one. 2. Measure out the plain icing sugar and the Sugar and Crumbs Raspberry Ripple Icing Sugar, and mix them together. Add about a third to the egg whites, and beat again until you get back to the soft peaks stage. 3. Repeat with the remaining two thirds of the sugar, and then whisk until the meringue is really thick and glossy – this will take a little while, so don’t give up. Add a generous dollop of pink gel food colouring (aerating the egg whites will make the colour a lot paler, so you need plenty) and whisk to mix through. 4. On a sheet of siliconized baking parchment, spread the meringue mixture out in 6 small circles about 10cm in diameter, leaving a little space between each one. Place in the oven and bake for one hour – for the best, crispiest results, don’t open the oven at all until the end (when you can check on them, if you need to reassure yourself! 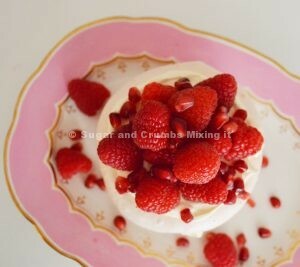 ), and then turn the oven off and leave the meringues in there, with the door shut, until cold. 5. Whip the double cream until just holding its shape. 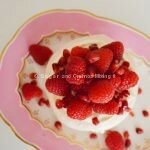 To assemble the dessert, sandwich three of the meringues together with cream, and then repeat with the other three. Top lavishly with fresh raspberries and pomegranate.